Discover the restoration of Charles Le Brun’s masterpiece under your eyes! 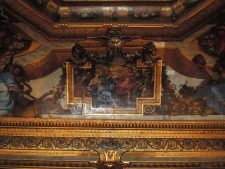 Starting on October 11, 2016, the Château de Vaux-le-Vicomte undertakes the restoration of the Chambre des Muses‘ ceiling, decorated by Charles Le Brun’s workshop. This ambitious site, covering 175 m², will last 6 months and will entirely take place on site, behind transparent walls. A rare chance to discover the backstages of a masterpiece’s rebirth! The Chambre des Muses was Nicolas Fouquet’s formal stateroom, it owes its name to the Nine Muses who bring Charles Le Brun’s beautiful ceiling to life. The central work of the ceiling is an oil painting on canvas measuring 4m x 4m Le Triomphe de La Fidélité, commissioned to demonstrate Fouquet’s loyalty to Louis XIV during the wars of the Fronde. We discover Clio, the Muse of History and Renown, along with Prudence and Loyalty, and at the corner of the arches, the eight other Muses, two by two: Euterpe, Music; Calliope, Epic Poetry; Terpsichore, Dance; Melpomene, Tragedy; Thalia, Comedy; Erato, Lyric Poetry; Polymnia, Painting; and Urania, Astronomy. 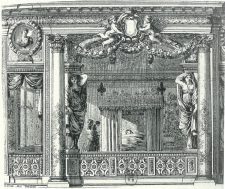 The Chambre des Muses is unusual in having an alcove with a raised platform that was wanted to host the Superintendent’s bed but was never entirely finished. 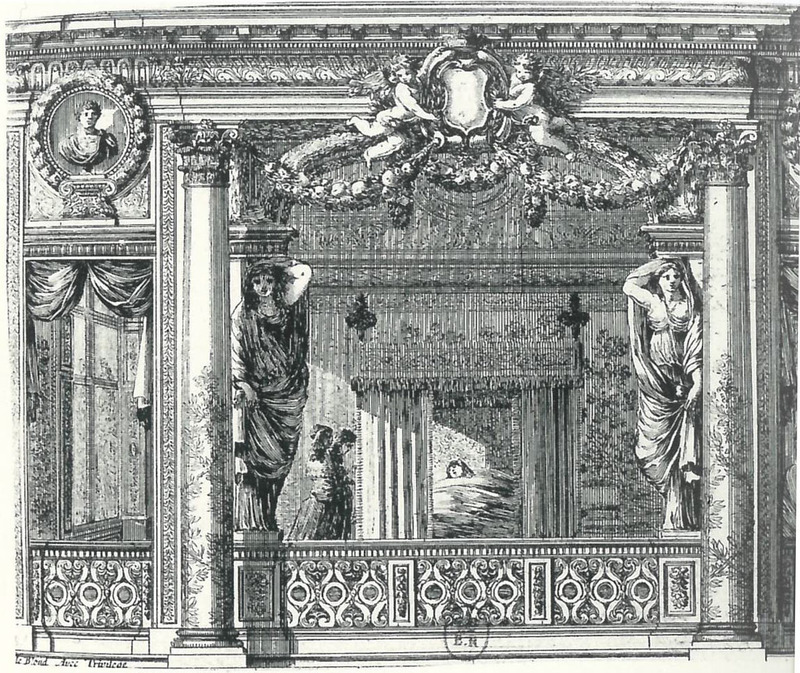 This platform was used as a theatre stage by Molière on July 12, 1661, for a performance of The School for Husbands, in the presence the members of the Royal Family. The second oil on canvas that will be restored, La Nuit, an oval painting by Le Brun, is on this ceiling, and features the goddess Diana, elegant with her blue veils. An in situ restoration in front of the visitors! The very refined decoration of the Triomphe de La Fidélité symbolically links the sciences and the arts. One can see the dawn of the first Versailles style, inspired by Italian mannerism. Damaged by previous work on the original canvas, this large painting is in a poor state of conservation and requires urgent attention. The central canvas will be taken down and restored on site, allowing the restorer to carry out the work in public. (NB: the conservators will be working on site on weekdays, exception made of the Christmas national holidays). Each of the decorative paintings on plaster will be cleaned with 10% triammonium citrate and the large sections of repainting will be “reworked” with retouching. The gold-leaf sections will be refixed by injection of an adhesive. The two paintings on canvas will be cleaned and their gold-leaf sections refixed. Lastly, the two frames of the paintings will be restored in waterbased gilt. The technical choices of the conservation-restoration products used will be established according to their qualities, their reversability, and their non-toxicity for the health of the restorers as well as the visitors. Indispensable and ambitious, this restoration site has been estimated at €450,000. It has entirely been financed by a generous American donor, Alexis Gregory, a businessman and collector. 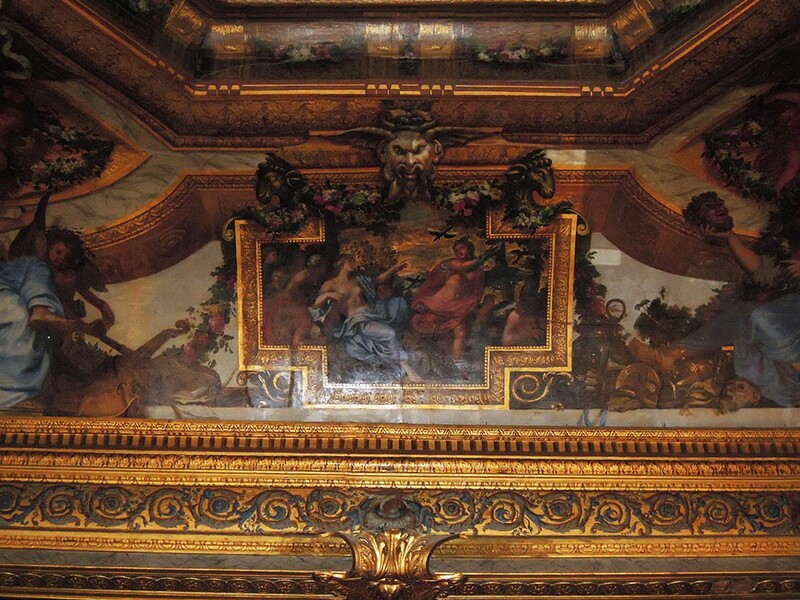 The restoration of the ceiling of the Chambre des Muses was entrusted to the Ariel Bertrand workshop, which had already restored the Cabinet des jeux in 2015.